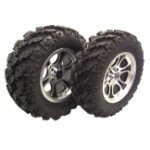 - GBC Gator ATV tires are sold individually. - Our Gator tires generally ship out within 1 business day! 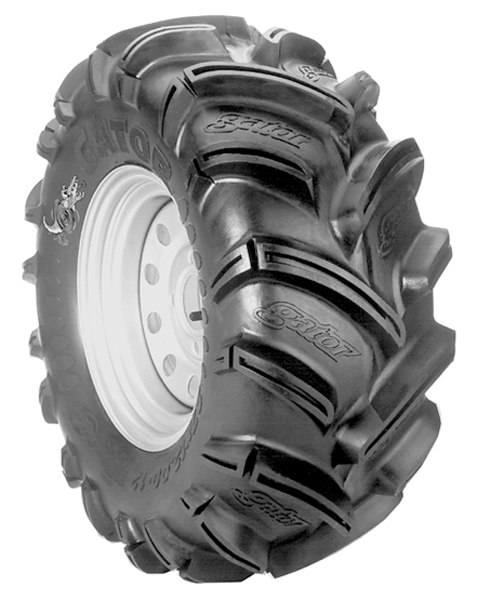 - 6-ply mud atv tire. These are THE BEST ATV tires you can get. I had them on a 2003 Honda Foreman 450 and put them on in 2003. I sold it in 2014 and there was no wear what so ever!!!!! Amazing!!!!! I matched a set of these tires in the 28 inch size with a pair of ITP SS316 wheels and installed on my 2009 Suzuki 500 King Quad with 2 inch lift kit. I ride the mud and water holes every weekend and love these tires. They pull like a freight train through the deep muck and surprising to me, even with the aggressive tread design, they ride pretty smoothly. I would recommend these to anyone who asks. Price was right and free shipping, what more could you ask for. I bought a pair of these for my Honda foreman 400 and they work great in Mud,snow and trail riding!!! I definetly recommend these tires!!! Great tires for mud,not for paved surfaces. I did a lot of looking trying to find tires for my RTV. Had a hard time regarding sizes that would work. I found the Pure Offroad site and called them. Very knowledgable and easy to work worth. Delivery was quick and I already have the "Gators" mounted. I'll keep this short: -awesome bite -mounted 22-11-10 on a 10" 3+4 rim. Perfect. -These things dig..... haven't got stuck. -Smooth ride? - 8 out of 10. Not nearly as kidney wrenching as they look. -On a golf cart you need the hp to turn them cause they don't slip. Especially if your running electric. -Orignally bought 2 for the rear (2wd). Buying 2 more for the front cause they are fantastic. -Actually pretty light for their size. -Great tire, great tread, simple. Pure off road was great. Fast delivery great price. Zero issues, just a great company. Has a set on a mule they do a great job in this Louisiana mud. I bought a set of 28" gators a while back frm this site. They weighd 31 lbs ea. I recently sold them bc I looked into 30" ITP mudlites. Theu weigh 33 lbs ea. and they r a TRUE 30" tire. The mudlites have 1.3" lugs where as the Gators had 1.21. Gators are good tires but y not buy a tire that is goin to last longer, is +2" bigger (because i dont think the gators were true 28", and is only 2 lbs heavier, and taller tread. YES your goin to spend about $250 more but it is COMPLETELY worth it. The tire is wonderful great for every terrain. No matter if it is mud, snow, gravel and sand it is great. They are great for a farm which I live to pull trailers and cargo through mud and everything that lays I'n my rutted tracks they pull great. Hope you guys buy these tires. Great tire, Off Road is a excellent company. Extremely fast shipping. I put these tires on my 2013 Honda Foreman ES w/Power Steering. Definitely an improvement over the stock tires, but ride quality has diminished. They are an awesome tire when it comes to traction, don't even use 4wd most of the time. They are quite squirrelly on the hard pack due to the lug stiffness. Also more vibration on the hard pack due to the lug spacing. Also notice the machine is a little doggish due to the weight (these tires are pretty heavy). Overlooking these three issues though they are really good tires. Think I'm gonna go with the interco swamp lites when these wear down. Had a set on my old quad and they rode better. My first pair of 22x11 were on a Bear tracker 250. Very pleased on how durable these tires are and very minimal wear on all terrain. These tires dig like crazy in the snow. Never got stuck in the deep stuff. My new set is on a Trail Boss 330 (22x11) and I'm again blown away with how tough these tires are and how well they grip for a 2wheel drive machine. You could put them on the back of a garden tractor!. Money well spent for the 2nd time!! I purchased these for my kids 2012 Honda 250 Recon ES Four Wheeler for extra lug, ply & looks and achieved them all with the GBC Gators! They handle & ride great as well, with no loss of power with the factory sizes. These Gator tires have been a great purchase! They can go through anything my son decides to tackle! We are very pleased with them. This is my second set of gators decided to go bigger after my lift. These are awesome tires little wear, great looking,and lots of traction. You can go wrong with GBC gators. Great tires with great tread couldn't ask for a better tire especially for the price. Will buy them again when needed. GBC Gator Great Tire Great Price! Was a bit skeptical at first but once I saw the roostertails fly, I was completely satisfied with the Gators. They perform extremely well in muddy conditions,and tear through previous obstacles faced with ease. Shipping was quick and easy. Would definitely do bussiness at Pureoffroad in the future. Bought the GBC Gators for my Honda Rancher 350 and I am impressed. Traction is great. For the quality you get the price is unbeatable. These tires are awesome i went threw so much mud and didnt get stuck 1 time! Q: Are Gator 28x10x12 still available? A: Unfortunately no, they are no longer available through us. I'm not sure if anybody else still has some. Q: Do you have 27×12×12 gators ? Q: I would like to purchase two 27x12x10 tires but they are not listed under size options are they available? A: Unfortunately 27x12x10 is no longer available in this style of tire. Q: Does the wheels come with the tires? A: No, this is just the tires, if you want rims you have to buy them separate. Q: What is biggest size I can use on 2016 Grizzly 700 special edition? -where in Ontario can I buy Gator tires? A: 27 inch is the biggest size I would recommend for your Grizzly if you don't have a lift kit. This tire has been discontinued, I would suggest picking out a different tire. We can ship tires to Ontario. We don't know any dealers in your area.